This is a crude photo of a rainbow after sunset, a noctilucent rainbow. It was taken at 8:34PM, sunset was at 8:29PM so the sun was already below the horizon. The photo was taken pointing southeast, away from the setting sun. I tried to go outside and get a better photo but it had already faded. I have never heard of such a thing. I searched online and there are a few photos of this phenomenon, but it is exceedingly rare. Storm clouds in the west were high enough to be lit by the sun below the horizon. 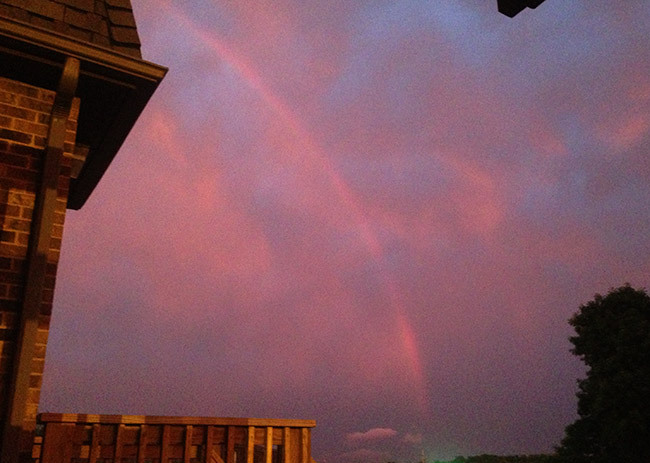 It made a bright red sunset, so the rainbow was illuminated by red light only, making a red rainbow.